Delaware Valley Aquatic Gardeners Association is a planted aquarium club encompassing Pennsylvania, Delaware, and New Jersey. We are a community made up of planted aquarium enthusiasts striving to advance the art of aquatic gardening by sharing members collective experiences, knowledge, and devotion to our planted aquarium hobby. We are devoted to maintaining an educational, fun, and supportive environment where members can share their joys and learn from their frustrations. 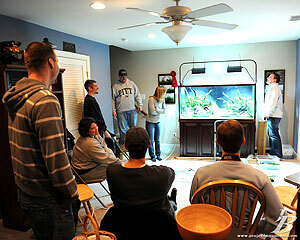 All Planted Aquarium Enthusiasts are Welcome to come to our aquatic gardeners meetings. We strive to keep our aquatic gardeners meetings fresh and new, covering new topics, new approaches, and established methods to help our planted aquarium members be successful with planted aquariums and aquatic gardening. If you would like to join us, please Visit Our Forum on Aquatic Plant Central.